If you’ve been reading my blog for a while, you already know how much I respect Maggie from She Let Them Eat Cake. Early on in my blogging, I adopted her for Adopt A Gluten Free Blogger. I subscribe to her blog, and I think you should, too! Recently, she posted a recipe for Rosemary Onion Crackers. She encourages people to try different flavorings. As soon as I saw it, I knew I was going to have to adapt her recipe and put my own spin on it. I’ve had a hankering for sage lately. I know, I know – it’s a fall herb. It’s the height of summer. What am I doing craving a fall herb in the height of summer. I don’t know, but I just decided to go with it. So, here is my adaptation of Maggie’s excellent recipe. Preheat your oven to 350 degrees. In the bowl of a food processor, pulse the garlic and sage leaves until minced. Add the ground flax seed, almond flour and salt. Pulse until well-combined. Pour in the maple syrup and process until mixture forms a ball. Scrape the ball into a bowl and stir in the chia and poppy seeds. Place dough between 2 layers of parchment paper and role thin with a rolling pin. Remove top layer of parchment paper. Bake in preheated oven for 15 minutes. Remove from oven and cut crackers into desired size with a pizza wheel. Return to oven and bake until golden brown and crisp (another 5-10 minutes). 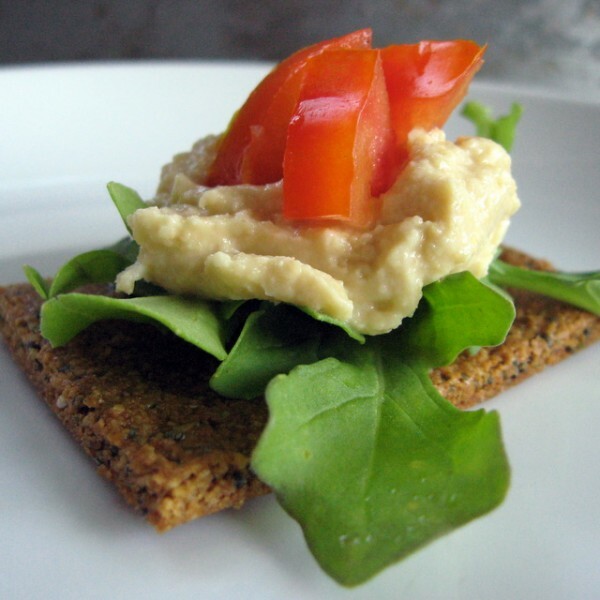 These crackers are excellent all on their own, but strong enough to stand up to toppings. I like them with something a bit bitter, like arugula. It counteracts some of the sweetness of the maple syrup. 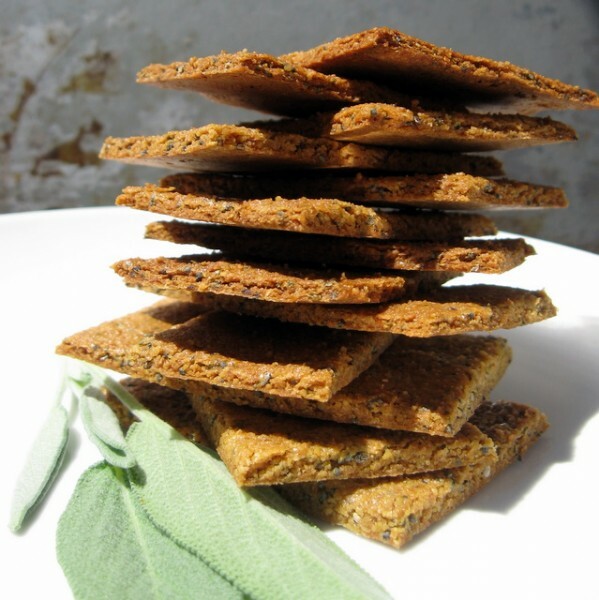 I think a sweet cinnamon version of these crackers would be amazing. What flavor are you going to try? This entry was posted in flax seed, grain-free, nuts, snacks, vegan. Bookmark the permalink. I love it! These look fantastic – and your tip about rolling them out is superb. Might have to add it in my instructions. I’ll link back to you. Pictures are great. And thank you so much for your kind words. I means a lot to me. I should do that! Thanks, I will! These look great. I’ve been trying to get a lot more flax in my diet and it seems to be helping decrease the hot flashes. This would be a tasty way to get even more. Thanks for the birthday wishes. Thank you! They are tasty. I definitely think a cinnamon version is next on my list of kinds to try. these look great, too! talk about fiber-y goodness. I’ve been playing with this recipe all week as we’re grain free at our house. My favorite so far is to double it and I changed the ground flax/almond flour ratio to 1 1/4 flax and 3/4 almond flour. I did 1/2 cup maple syrup and 1/2 cup grapeseed oil. I don’t have chia seeds or poppy seeds and so I’ve been using all flax seeds, but I’ll try the others next time! I replaced the sage with rosemary once and that was very flavorful. We’ve dipped them in guacamole, covered them in peanut butter and enjoyed the old cheese and crackers thing. Thank you! Great recipe!